Drydocks World, an international service provider to the shipping, offshore, oil, gas and energy sectors has successfully been certified to European Standards EN 1090 – 1 and EN 1090- 2. The certification programme is part of the European Union’s Construction Products Regulation CPR 305/2011. Drydocks World’s main yard activities undertaken in its facility are found to be complying with Factory Production Control (FPC) requirements by the auditing body. The scope of the certification includes Corrosion Protected Load Bearing Steel Structures, which can be manufactured under Execution Class 3 (EXC 3). Drydocks World is authorized to apply CE Mark (European Conformity) on load bearing steel structures manufactured in-line with European standards that regulate the fabrication and assembly of steel structures.venture into the construction of Onshore Civil Steel Structures by meeting the European Union’s CPR 305/2011 requirements. Drydocks World has already reinforced and aligned the welding processes in-line with EN ISO 3834-2. 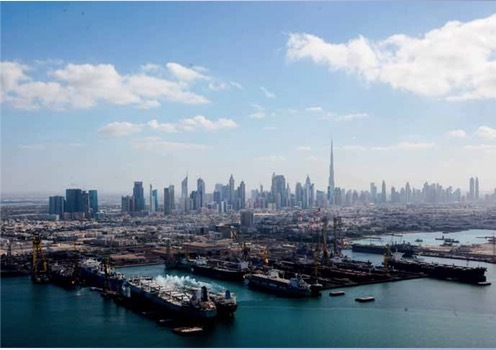 Over the past 33 years Drydocks World-Dubai has become a leading provider of marine and offshore services to the shipping, oil, gas and energy sectors. Conceived as an ambitious project under the guidance of H.H. Sheikh Rashid Bin Saeed Al Maktoum, the late Ruler of Dubai, the yard is strategically located in a rapidly developing region of the world. Drydocks World maintains high HSEQ (health, safety, environment and quality) and operational excellence standards, utilizing the yards world-class infrastructure to exceed the expectations of clients. The dedicated workforce and state-of- the-art-facilities at Drydocks World on average complete over 300 projects per year, with a record of handling 42 refurbishment projects simultaneously. The yard is spread over 200 hectares, four dry docks, with the largest dock capable of handling the world’s largest ship, and over 3,700m of berth space. Innovative projects for key global players have been constructed in Drydocks World, breaking records for some of the largest new build offshore fabrication projects worldwide. In recognition of its excellent services and world-first projects, Drydocks World has received numerous awards and accolades including consecutively winning the prestigious Mohammed Bin Rashid Al Maktoum Business Award 2015 in the manufacturing category, which is the highest level of national recognition for business performance excellence in the UAE. In addition, Drydocks World has been honoured with: the prestigious ‘5 Star’ rating from the British Safety Council for the past 13 years; the BSC ‘Sword of Honor’ on ten occasions; the International Business Excellence Award – 2015 for innovative solutions; and the International Seatrade Awards- 2015 for Clean Shipping. The yard has been recognized at the Shell Contractors Workshop Awards, winning best HSE initiative for chariot robotics blasting; further, Drydocks World received the Best Repair Yard award at the 7th ShipTek International Maritime Awards. Under the Corporate Social Responsibility category, Drydocks World has won at the Seatrade Awards 2016 and the Maritime Standard Awards 2015. Drydocks World has achieved significant recognition for the accomplishments of the organization, and looking forward the business aims to achieve further success for the UAE’s maritime industry, positioning Drydocks World as an international yard of choice.